SKU: JBP21. Categories: Mythical Characters, Sci Fi. 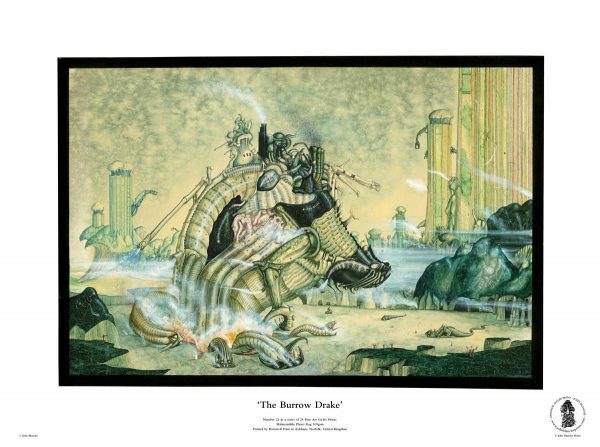 Collectable Giclée fine art reproduction of the John Blanche fantasy artwork, The Burrow Drake, printed at original size (631mm x 470mm). Your The Burrow Drake print is produced with the highest quality materials and comes embossed with the John Blanche Prints logo for authentication. John Blanche Prints are printed to order and securely shipped in a postal tube from the UK. Standard UK delivery is £6.95 per 5x prints. Your prints are securely packaged in a delivery tube. Fees are added at checkout. Please note a signature will be required. Delivery is available worldwide*. Customers in the US, Australia, New Zealand, and across the EU can order unframed prints online now. For all other overseas delivery options please contact us first with your requirements.